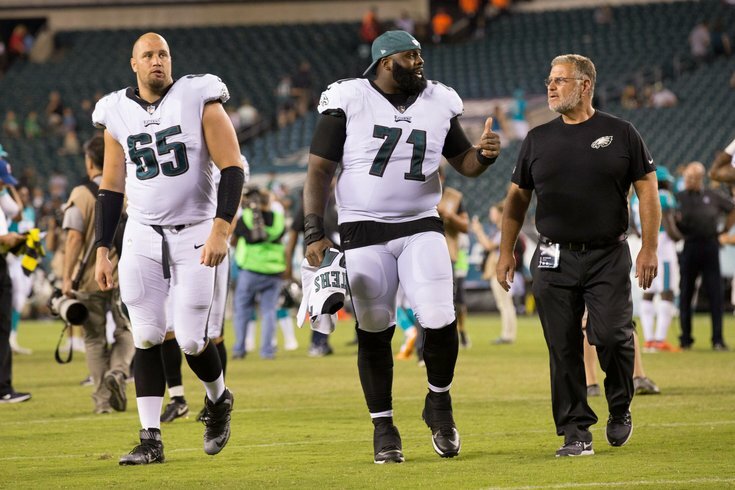 Jason Peters' recovery is 'amazing,' according to Jeff Stouland. On Monday, the Philadelphia Eagles' assistant coaches gathered for a media session with reporters for a half-hour or so each. I chose to camp out with offensive line coach Jeff Stoutland for the entirety of the offensive portion of the day. Rather than produce a column on a few of his points, we'll just publish all of Stoutland's thoughts on his linemen, from top to bottom, organizing his words by player while cutting out the filler. To note, the focus was mostly on the reserves, and Jason Peters. • The sentiment is that Peters' recovery is nearly complete. "The guy is amazing. Amazing... Every guy in our meeting room, to a man, will tell you that he is still the best. He’s incredible. I don’t know how somebody recovers that fast. The injuries that he has had have not been like nicks and bumps. • On if he has any reservations about Peters being a 36 year old tackle recovering from a serious injury: "Not in my mind." • "He loves to be around other players and challenge them. I think that’s very important to him." • "He is very prideful, and he loves a challenge, and he loves to compete. He even does it when we’re out there (in OTAs). When we were out there on Thursday, we’re out there and he called the rookies over. He said, ‘Come on, let’s see who can turn the sled.’ He loves to compete." • On Peters moving from tackle to guard: "Until he proves that he can’t play that left tackle spot, I wouldn’t even have that conversation because he’s so valuable at what he does at that position." • “We all know what a great player he is. He’s a Hall of Famer. I don’t think many people realize what a good person this guy is, what a goodhearted person he is. He does so much outside for people, and nobody knows it because he keeps it quiet. He keeps it on the down low. And the stuff that he does with the young players, it’s unbelievable." • "To me, his strength is when he’s in space. He’s really athletic. Center is a position where you have to be able to move, like Kelce, and I think that he can do that too." • On why Seumalo has gotten so few reps in practice: "That’s a medical question, and I don’t answer those questions, but he’s a little dinged and he won’t be in there right now." • "He can play all five positions, and the tight end position (in jumbo sets). I think last year he played every position. Because of his athleticism, and his quickness, and his feet, he can do that stuff. Like I said, that’s tremendous value for any player. In this league, with the number of players they allow you to keep, it’s advantageous to be able to play more than one spot." • "Mentally, he is as sharp as anyone in that room. There are no issues with him not understanding a concept or a play." • "This is the time of year for those guys to learn the system, learn the techniques that are involved. As many reps as we can get them, is valuable. I call them bars of gold. He’s working with two different groups now, so he’s getting double the reps, which he needs. He’s way behind." • On Mailata’s pro day: "When you do enough of those workouts – we go all over the country and we work these guys out – there’s a lot of validity to that. I think when you leave a workout, like I’ll never forget we left Lane Johnson’s workout, and I was just like, ‘Holy cow, this guy is special.’ You get that feeling, and I had that (with Mailata). I had a really good feeling when I left there. A guy that big, with the way he controlled his body, and the way he took off and ran, I was just very impressed." • "He’s a very intelligent player, but you have to realize, to develop as an offensive lineman takes years, and he has never really done any of that stuff. But the coach that worked with him (prior to the draft) – and he wasn’t there very long – but the amount of time that he had with him, to have him come in and know just basic terminology, to me, I was impressed with that. I thought he did himself justice by being there and having that coach there with him." • "Matt is coming along fine. Obviously we’re in the early stages right now. He’s trying to learn the playbook. He’s trying to learn the techniques that I’m teaching, and that we’re teaching. He plays both guard and tackle. I don’t know if you notice this when you’re out there, but he’s getting second-team reps as a guard, and then when we get to the third group, he plays right tackle. "We’re asking him to do a lot from a mental standpoint, because he’s playing two different positions. It’s not like he’s going from right guard to left guard. He’s playing right tackle, and then he has to flip the switch because I teach those players differently. I think he’s doing a great job, but there’s a lot of room to improve, and that’s the mission right now." • "Collectively, we all came together and felt that this guy has value because he can play two positions. He has very strong hands. When he puts his hands on you, you’re done. We have to get him to use them right, and hit the right target, but his hands are very, very strong." • "He has developed, in a good way. You have to realize he was a defensive lineman. The thing about Taylor was, a lot of the college players, they’re lacking in the use of their hands. They’re limited too in the amount of time that they can practice. But I think that his value, as a defensive lineman, all he did was pound the sled. You guys would be out there in the old days when he was here as a D-lineman. He’d be on his knees and he’d be striking the sled. "You could see that when he played as an offensive lineman. You could see that when he struck somebody with his hands. He was advanced in that category. That was the one very positive thing I saw way back when. "When I look at offensive linemen and evaluate them, there are certain areas that we look at, that we hone in on, and he had a lot of those things that I thought you had to have to be a good offensive tackle in this league. With that said, I just felt like he needed more time to develop, and find out really who this guy really is, and I think that he’s doing a fine job of that right now."